Nicely decorated bottles of chili pickles are simple, yet eye-catching gifts (or products to sell), especially when you use a whole medley of different colours and sizes of chilies. Home made chili pickles are the perfect way to preserve the fresh just-picked flavour of chili peppers. It’s no secret – we love chili peppers. And we like them as close to freshly picked as possible. Bursting with freshness, flavour and aroma. Dried chilies tend to be too overpowering for us. Besides, they lack the complex flavour profile of fresh ones. 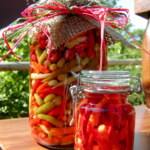 Pickled chilies are a great way to preserve that fresh just picked flavour, and they are quick and easy to make. Nicely decorated bottles of chili pickles are a simple, yet eye-catching gift, especially when you use a whole medley of different colours and sizes of chilies. When making pickled chili to give as gifts select chili varieties to suit the receiver. For chili heads use extra hot varieties like habanero and tabasco. For soft mouths use milder varieties like Jalapeno and Hungarian wax. If you don’t grow your own chilies you’ll find a ready supply at your local greengrocer or supermarket. 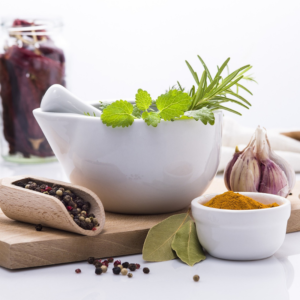 Cooking with herbs and spices is all about stamping your own unique personality on simple recipes. This basic recipe is no exception, it lends itself to endless variations and with that, the opportunity to create your own signature pickled chillies. 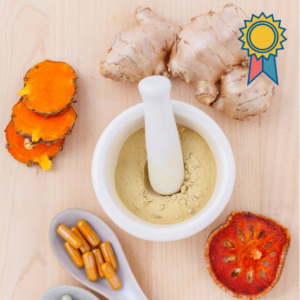 English pickling spice consists of dried ginger, yellow mustard seed, mace, allspice, black peppercorns, cloves and coriander seed. If you don’t have pickling spice, add as many of these that you have on hand. Or make your own pickling spice. Making your own has the advantage that you can change the proportions which will result in your own unique flavour profile. Don’t limit yourself to the English pickling spice recipe. In the Middle East and North Africa they make pickling spice with coriander seed, ground ginger, golpar, powdered dried lime, anise, cinnamon, cumin seed and nigella. Apart from the spices mentioned above you can experiment with: bay leaf, fresh ginger, garlic, lemon grass, lime, olives (in brine), oregano, rosemary, and soy sauce. These are all flavour pals with chili peppers, and they all work well in a pickle. TIP: You can add the pickling spice in a muslin bag and remove the bag before gifting or selling your pickles. It makes the final product look ‘cleaner’, and it keeps your recipe a secret. You can still add a few carefully selected individual pickling spices for decorative effect if you like. The vinegar is a key flavouring component (and the only preservative) in your pickles. Most store bought pickles is made with ‘cheap’ vinegar. This gives you another opportunity to make your home-made chili pickles stand out from the crowd. Use a vinegar with a good flavour profile. And don’t be shy to experiment with blending the vinegar. For example, if you are on a budget blend a cheap white vinegar with a small amounts of good quality red wine or sherry vinegar and a bit of balsamic vinegar. If budget is not a concern, go all out on a good quality red wine or sherry vinegar. You can also use the sugar to give your pickles a unique twist. Experiment with brown sugar, castor sugar or any other sweetener that tickles your taste buds. 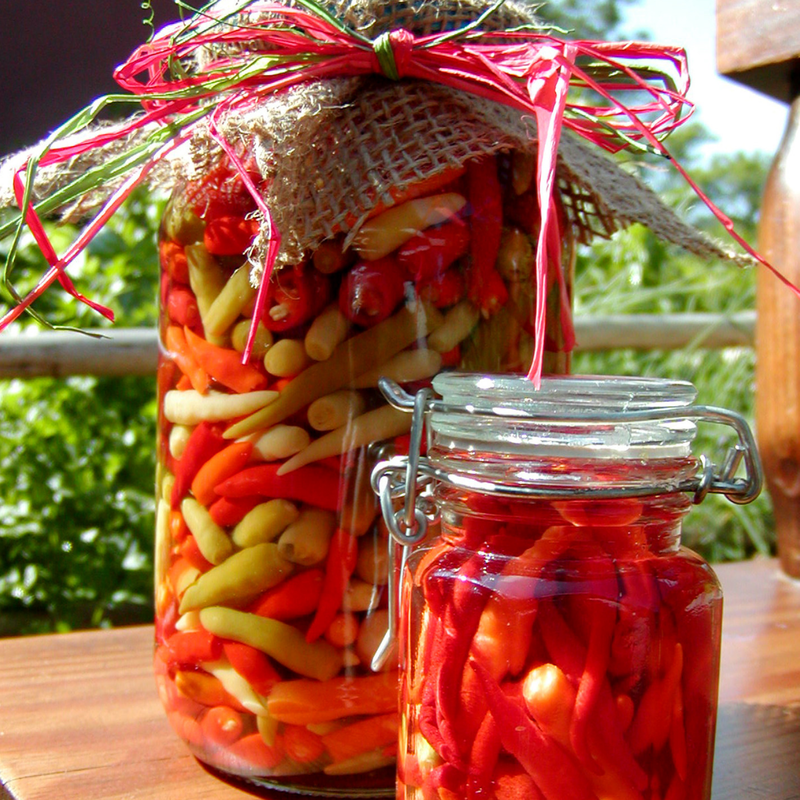 Pickled chilies are a great way to preserve that just picked flavour, and they are quick and easy to make. Wash the chillies under running cold water. Poke a few small holes in the top of each chili to allow the pickle to penetrate them. Add the water, vinegar, optional pickling spice, and sugar to a pot and slowly bring to a boil. Remove from the stove the moment it starts boiling. Meanwhile, pack the chilies into the sterilized wide mouth jar. Carefully pour the just boiled pickle mixture over the chilies, leaving no headspace. Let it cool and remove trapped air bubbles by gently tapping the jar on the table. Seal, label, and store in the refrigerator. Use a good quality wine- or sherry vinegar. The better the quality of your vinegar the better the quality of the pickles will be. English pickling spice consists of dried ginger, yellow mustard seed, mace, allspice, black peppercorns, cloves and coriander seed. If you don't have pickling spice add as many of these as you have on hand. You won't use all of the pickle (water and vinegar mix). You can store the excess in the refrigerator for later use. 5 Stars = Best Ever! 4 Stars = Loved it! Elevate your cooking from bland and boring to bursting with flavour and flair! Loved it so much that the jars are already empty. Will have to make some more. This is a wonderful recipe. The brine is perfect. The strength of this recipe is its simplicity. I have been looking for a chilli pickle recipe for a long time. I am going to make this and try it. Thank you very much.